As a child of the ’80s my interests coincided with the high points of the decade’s nerdiness: Dungeons & Dragons, Choose Your Own Adventures and text adventure games. 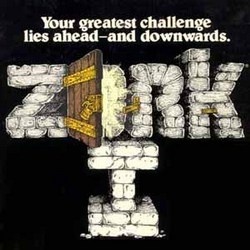 In text adventure games, most famously Zork, the player would interact with the game by typing out commands like ‘north’ (or just ‘n’) to go north, ‘examine’ objects, ‘look’ to view their environment, ‘give’ and sometimes ‘kill’. Sometimes this led to disagreements with the computer where rather than comply it would return with ‘I don’t know that word’ or ‘Too many noun clauses’. 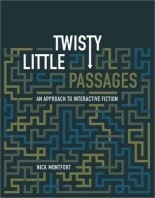 The games were marketed as both text adventure games and interactive fiction, though Nick Montfort argues in his excellent history and analysis of interactive fiction Twisty little passages that text adventure games are a subset of interactive fiction, because not all IF are adventure games. The first text adventure game was Adventure, initially written in the mid ’70s by Will Crowther and then modified by Don Woods on the Standford SAIL computer. Many of my nights were spent typing my way through mazes or puzzles. At school in year 7, there was a room full of green monochrome-screened computers on which we’d wander around searching archaeological ruins (the exact title of the game has disappeared, along with the teachers’ names). At the high point of the commercial success of IF, Douglas Adams was adapting his The Hitchhiker’s Guide to the Galaxy and future US poet laureate Robert Pinsky wrote the ‘electronic novel’ Mindwheel for Synapse Software. When I started high school the golden age of commercial adventure games was coming to a close. 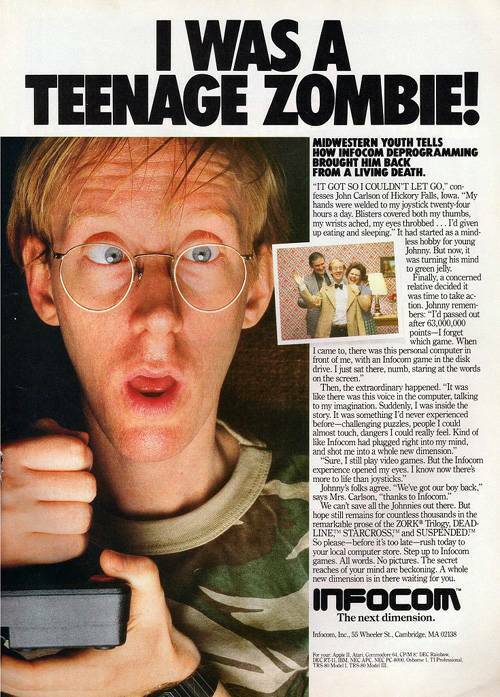 The biggest company that produced the games, Infocom, was bought by Activision in the middle of that decade and finally shut down in 1989. Though the commercial phase meant the death of financial viable interactive fiction, the form is live and well. After the close of the commercial era, IF was continued by dedicated fans, some of whom programmed out of ’80s computer magazines, books like Delton T. Horn’s Golden flutes & great escapes: How to write adventure games, or other construction programs. Interactive fiction is hardly out to displace or replace the book in some simplistic way, and arguments assuming that it is will soon be seen as obsolete. What is more troubling is that many people who are capable computer users and who also enjoy literature have never imagined that something like interactive fiction could be part of their literary and computing life. There have been fantastic games made in its independent period, but IF still has the problem that if you’re new to it you can be put off by the way the work interacts. A good (and necessary if you haven’t played/read IF before) is ‘A Beginner’s Guide to Interactive Fiction’ on Brass Lantern. You can also play recent games that have won the annual interactive fiction competition, IFComp. To play them you’ll need an interpreter; luckily, ifwiki has a list of interpreters by platform. This year Codeacademy started Code Year, which encourages people to learn to code for themselves. As a programmer, I’d recommend everyone learn to program. Knowing how to program gives you a vocabulary that lets you think about what you can do with computers in different ways – and so express what you think in different media or modes. In some ways, we live in a strange period of history where our language differs from the language we directly use to communicate with technology. There are various reasons (verbosity, speed, processing, accuracy) that programming languages aren’t a natural language, although the programming languages we do use are closer to human understanding than machine. In Inform 7 the syntax you use to write IF is a natural language syntax. Graham Nelson created it to test that very hypothesis: ‘that the natural language in which to write interactive fiction is natural language’. The Hole Below is a dark room. The lamp is in Seoul. If you’d like to learn online rather than from a book, the Inform 7 website has a list of tutorials. February also saw the launch of Playfic, ‘a platform for writing and playing interactive fiction’. And if you’ve a couple of hours to kill, Jason Scott, a technology historian and documentary filmmaker, has a fascinating documentary on IF, Get Lamp. 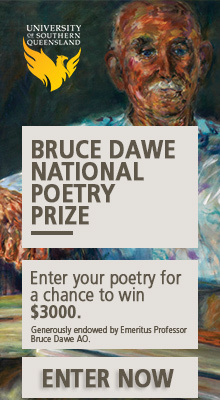 The diversity represented in broader fiction have their counterparts in IF. It’s likely that anything you’ve written for print could be expressed in IF, so perhaps it’s time to start playing/reading/interacting/writing/programming. Great post Ben. Your comment about programming giving us a language to express ourselves in different modes/media intrigued me. I’ve never really thought of programming having all the possibilities of language before. I’m also grateful for the pointers about how to get into IF. If you happened to have missed the geek phase sometimes some of this stuff can be a bit like being presented with a book when you’ve never seen writing before – it might look pretty and you might want to have a go, but you don’t have a way to start. Interesting point Ben about the way code differs from and yet is similar to ‘normal’ language. I wonder if we’ll see the two merge? Will we become more code-like or will machines be able to understand for want of better words ‘normal’ or ‘regular’ human speech? The closest I ever came to interactive fiction was Carmen Sandiego , and I hear that doesn’t really count. People, such as Paul Callaghan, have argued that narrative games are one of the growing forms of reading, particularly those that rely on player interaction and decision-making. How do you think these games relate to IF? Is the way we read in the future going to be a combination of these forms? Thanks for linking to the Code Year project. I’ve kind of become convinced that coding is a skill that all writers need. Benjamin, have you read Ready Player One? It’s kinda a tribute to the world you describe.